Cadbury, my favourite brand of chocolate, is being devoured by Kraft. For a deal worth £11.5 billion ($20.28 billion), or 860 pence a share, most of the articles I have seen talk about the worry of having to make ‘making significant cost savings’, ie job losses. And while I sampathise with the people that may loose their jobs, I worry about the state of my favourite chocolate. When Kraft takeover Cadbury wil they change the mix of the chocolate? Cadbury is an iconic brand of chocolate would you mess with the recipe? No being a fan of Kraft cheese. And noticing the recent Vegemite iSnack 2.0 debarcle. I am a little worried. Althought I see they also own Toblerone. So, maybe they can still make decent chocolate. I wil have to wait and see. 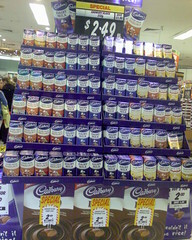 This entry was posted in News and tagged Cadbury, chocolate, Kraft, News, Search, takeover. Bookmark the permalink.